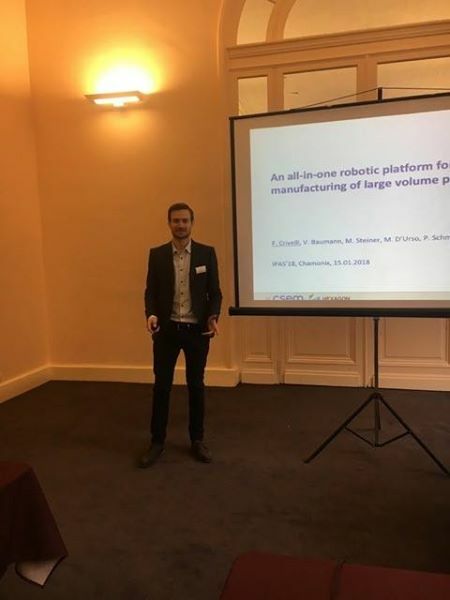 On Monday 15th, Kraken project was presented at the 8th edition of the International , in France by Francesco Crivelli, CSEM R&D Engineer. The paper presents the preliminary steps toward the development of this robotic platform, focusing on the use of the real-time feedback of an absolute laser tracker to control motion and positioning of the manufacturing robot. An all-in-one robotic platform for hybrid manufacturing of large volume parts. Abstract. 3D printing offers many advantages over conventional machining and its applications in industrial manufacturing is growing. However, existing additive technologies present limitations in workspace volume, accuracy and surface quality. These limitations could be overcome by combining both additive and subtractive processes. Such hybrid approaches allow layer-by-layer construction, alternating fast and rough material deposition with machining steps, when the layer’s geometry is finished. Despite its potential, the development and industrial application of hybrid machines is slow. Particularly, no systems exist for the construction of large parts. The project KRAKEN is well-situated in this context, aiming at the development of a novel, fully automated, all-in-one platform for large volume hybrid manufacturing. This powerful tool will not only combine additive with subtractive processes, but it will also include both metal and non-metal 3D printing, resulting in a completely new machine for the construction of large, multi-material parts. A control approach based on direct measurement of the end-effector position will allow a combination of large workspace (up to 20m) and high manufacturing accuracy (tolerances <0.3 mm, surface roughness Ra <0.1 μm). The proposed control strategy is presented and discussed. Finally, the use of an Extended Kalman Filter to fuse the laser measurement with the robot position sensors is presented and discussed based on offline evaluation.